Dimensions 1.25 by 6.25 by 8.75 in. In The Actor Speaks, Patsy Rodenburg takes actors and actresses, both professional and beginners, through a complete voice workshop. She touches on every aspect of performance work that involves the voice and sorts through the kinds of vexing problems every performer faces onstage: breath and relaxation; vocal range and power; communication with other actors; singing and acting simultaneously; working on different sized stages and in both large and small auditoriums; approaching the vocal demands of different kinds of scripts. This is the final word on the actor's voice and it's destined to become the classic work on the subject for some time to come. 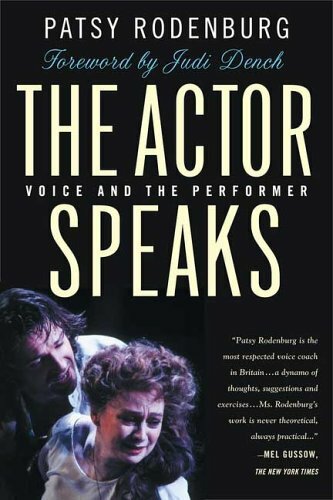 About: In The Actor Speaks, Patsy Rodenburg takes actors and actresses, both professional and beginners, through a complete voice workshop. About: Covers topics ranging from what every first-year acting student faces in class to what leading professional actors must achieve every night on the three stages of the Royal National Theatre.